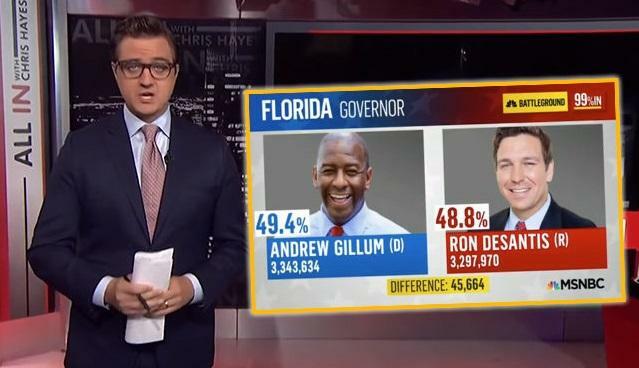 MSNBC's Chris Hayes had egg on his face Monday evening after an infographic aired a full day before the election showing Democrat Andrew Gillum prevailing over GOP rival Ron DeSantis by more than 45,000 votes with 99% of the votes counted, as first reported by Deadline Hollywood. Hayes told viewers: "Quick clarification here. Just want to say, earlier this hour, uh, we showed a graphic of the Florida gubernatorial race. May have caught your eye because our system had inadvertently populated some test numbers." "Obviously, we do not yet have any vote totals here, the night before the election," Hayes. "That was a misfire. Don’t worry. I was pretty confused when I saw it up there, to see it there myself." According to a Saturday survey by St. Pete Polls, Gillum leads DeSantis 49-48% with a 2% margin of error.